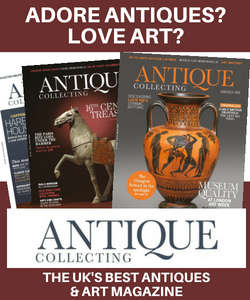 The Barbara Holliday Collection of Modern British Art, Jewellery and Antique Furnishings has sold for over £665,000, against expectations it would realise £400,000 at Essex auctioneers, Sworders. The collection, comprising 570 lots acquired by the late Barbara Holliday, a farmer’s wife from north Cumbria who had a fine artistic eye, featured works by leading lights of the modern British canon, ranging from Dame Elisabeth Frink to Sir Eduardo Paolozzi. Despite living over 300 miles from London, Holliday’s taste was very cosmopolitan. While her husband Ormond was fully occupied running the adjacent farms, she focused on what would become her two great passions – the garden and the interiors of The Gale, a handsome Victorian house in the hamlet of Highlaws, a stone’s throw from the Solway coast. From the late 1960s, Barbara had been a close friend of local born artist, Sheila Fell (1931-1979). Although Fell had both trained and lived in London, she painted mostly scenes from her birthplace in Cumbria. A total of nine works by Fell were included in the sale. The 1965 oil ‘Allonby, Approaching High Tide’, sold at £24,000 and ‘Mungrisdale, Lake District’ took £14,800. Both pictures had formed part of the exhibition ‘Through Women’s Eyes’ at the Castlegate House Gallery, Cumbria in 1989. Both were relative unknowns at the time, however Barbara was instrumental in arranging the major Carel Weight exhibition at Abbott Hall in Kendall in 1986 and, in Olwyn Bowey she found someone who was dedicated to the tradition of the artist plantsman. Bowey works mostly in her greenhouse, which doubles as a studio. Two typical large-scale ‘greenhouse’ oils sailed well above estimates to set new price levels for Bowey on the secondary market. ‘Myrtle’s Hanging Baskets’, a picture shown at the Royal Academy’s Summer Exhibition in 1990 sold to a London-based private buyer at £9,100, while ‘Standard Marguerite (2007)’, sold with an accompanying letter from the artist, went to a private buyer from Cheshire at £7,600. The previous high for the artist was ‘Fig Tree’, sold by Bonhams in London in December last year for £5,000. 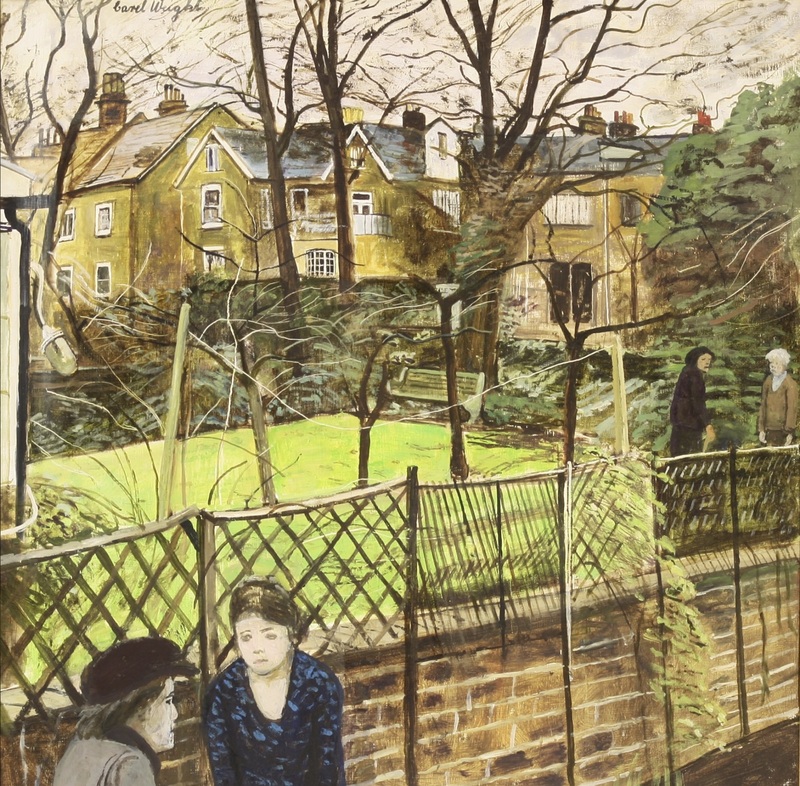 Works by Carel Weight brought in equally strong sums. The large oil ‘Figures in a Garden’ went at £5,000 while the much-admired small study ‘The Blue Umbrella’ brought £4,900. 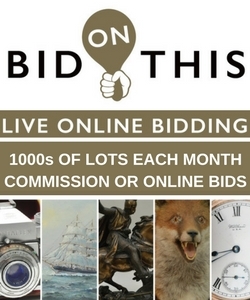 Both pictures sold to London-based private buyers. It was largely through Weight and Bowey that Barbara had met and bought works by several significant Royal Academicians of the late 20th century – among them Dame Elisabeth Frink, Sir Jacob Epstein, Sir Robin Phillipson, Anthony Gross, Maggie Hamblin, Ruskin Spear, Mary Fedden and William Roberts. The collection included three ink and gouache works on paper by official war artist Anthony Gross (1905-84), all of them depicting wartime London scenes. ‘Leicester Square, October 1940’, sold for £4,400; ‘Southwark Tunnel, Oct 1945’ made £4,700 and ‘Wartime Beds’ fetched £3,700. All sold to the same private collector in Dorset. The watercolour ‘Exotic Fruits and Orchids’ signed and dated 1992 by Dame Elizabeth Blackadder (b.1931) sold for £16,000, against an estimate of £3,500-5,000, to a private buyer in France, while the small Dame Elisabeth Frink (1930-1993) bronze of a golden eagle, signed and numbered 1/9, took £17,300, selling to a London-based private buyer. Leading the sale was the Mary Fedden (1915-2012) oil ‘Garden Bunch’, signed and dated 1988. It justified its choice as the front cover lot when it sold to the London trade at £38,000, well above the estimate of £5,000-7,000. Late in the artist’s life, Barbara had formed a friendship with Sir Eduardo Paolozzi by whom she was gifted several plaster sculptures. Paolozzi’s 16in (39cm) bronze bust of the American jazz pianist and bandleader ‘Count Basie’ – one of just three casts made in 1987 and the only example likely to come to market – sold to a local private buyer at £18,400. The artist’s much earlier collage ‘Dowicide’, dated 1952, sold at £11,300 to a London-based private buyer. 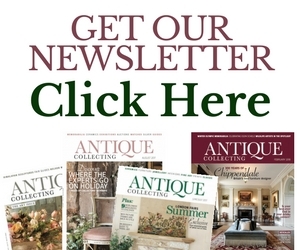 As well as her art collection, the sale also includes Holliday’s expansive collection of Georgian and Victorian furniture and chattels, plus her jewellery. Highlights of this well-received aspect of the sale included a late 17th century brass winged lantern clock signed to the dial WM Speakman, London for the ‘Third Phase’ maker William Speakman who operated from a workshop in Hatton Garden and a late 18th century two row garnet rivière with a cruciform pendant. They added £5,700 and £3,900 respectively to the total.